Scene 26. THE OUTSKIRTS OF A SHANTY TOWN “STANDARD FALLS”. UNTIL RECENTLY THE RESIDENCE OF LOCAL IMPERIAL SERFS THE SETTLEMENT HAS BEEN ABANDONED SINCE THE RECENT URSA MINER BROTHERHOOD OFFENSIVE. INQUISITOR VERHOEVEN, ROSA “GRAVEDIGGER” STONE, PAT THE ASTROPATH, AN ASSASSIN AND TWO LOCAL GUIDES ARE CONCEALED IN ONE OF THE SHANTY DWELLINGS. My respect for the Huscarl grows. Conveying that data via cyber-mastiff was a cunning gambit. Maximilian Reactorsmith is more than merely cunning. If my suspicions are correct then he has endured the unimaginable to survive to this point, let alone communicate with the outside. We must search these buildings and locate him, but beware: there is more here than meets the eye. Although the Tarot is weak this far from the Astronomican, many signs point to the presence of xeno puppeteers. INQUISITOR VERHOEVEN NODS TO THE ASSASSIN. THE ASSASSIN ACTIVATES A WRIST MOUNTED PIECE OF EQUIPMENT. EFFECT: the Assassin becomes indistinct visually, his suit mimicking his surroundings. Standard search and sweep protocols. Five metre spread. No sound. 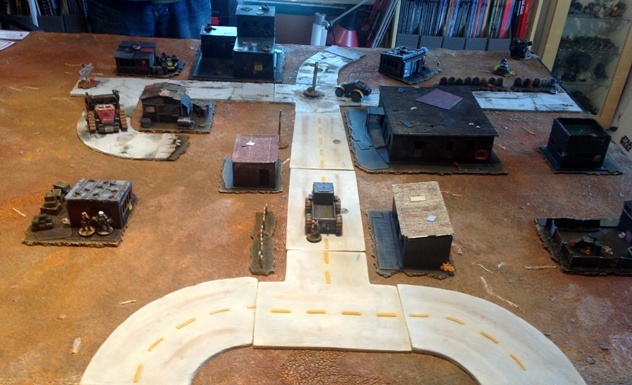 PB played the Inquisitorial retinue again for this scenario. 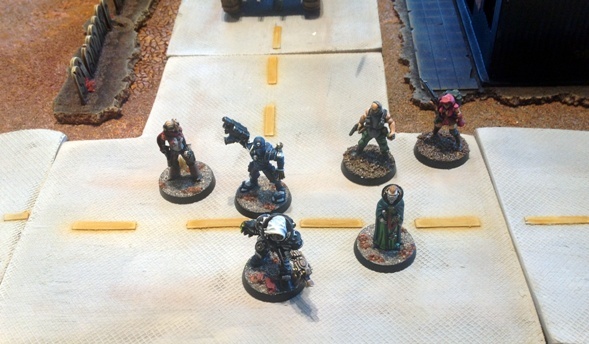 This time he added a pair of local guides/militia plus a member of the Officio Assassinorum. The guides/militia are the only things used in the campaign that were painted by someone other than me: Mattias from Phreedhs Miniature Stuff. The two that were fielded here are shown more clearly on either end of this photo. 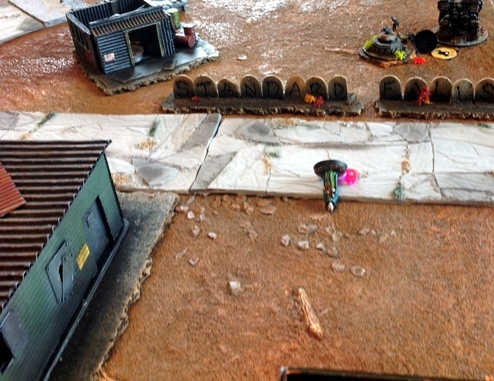 The Inquisitorial retinue are searching for the captured Ursa Miner Huscarl. 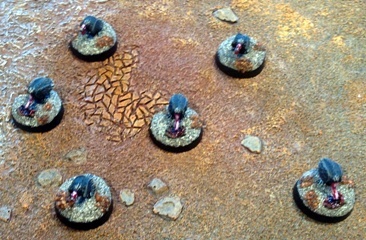 I used my vultures as objective markers. The buildings in the shanty that might contain the Huscarl were marked with these vulture objective markers. The ridiculously named Huscarl is being held and subjected to brutal treatment by mind controlled members of the Ursa Miner Brotherhood in one of the buildings with a vulture on it. The UMs are commanded by a Tenebrainian Cerebalite (also known as an “Enslaver” in some Imperial circles). The Tenebrianians have been revealed to have the majority of the Ursa Miners in their tentacled thrall since the start of the campaign (OMG!). The Cerebalite also has it attendant Medushark begging for psychic feedback scraps. This forces mission is to prevent the Inquisitor and his cohorts from rescuing the Huscarl and revealing their evil machinations. The Cerebalite leads a Medushark, a two man heavy weapon team, a thudd gun (mortar) and four Steel Warrior troopers in addition to the Engineer that featured in the last episode. 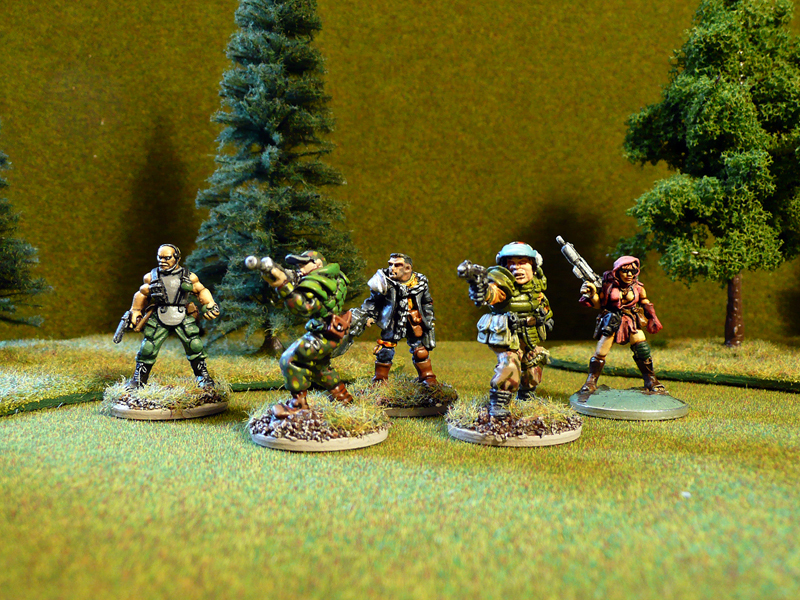 Verhoeven and his crew deploy to the north of Standard Falls. The Huscarl – Maximilian Reactorsmith – is kept against his will in one of the row of buildings on the opposite side of the battlefield. Steel Warriors prepare for the Imperial assault. 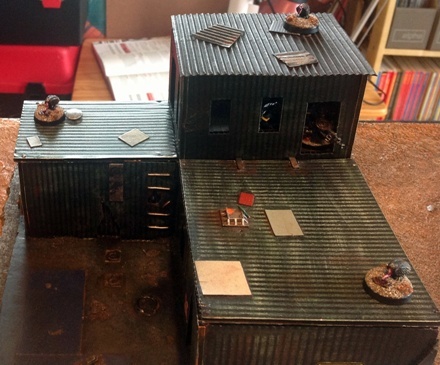 The two-man heavy machine gun team takes the high ground covering the approach. The assassin (top left) having infiltrated ahead of the rest of the Imperial force is now poised to strike. While the rest of the Imperials cautiously advance under thudd-gun fire the assassin checks to see if the Huscarl has been hidden down a well. The well guard puts up fierce (and frankly highly unlikely) amounts of resistance, allowing enough time for the Cerebalite to sic his Medushark on him. 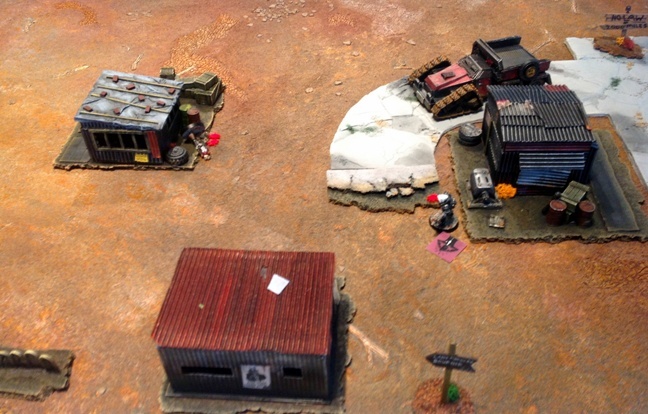 Verhoeven and sidekick Rosa exchange fire with the Squat engineer and his Steel Warriors while the thudd gun fire pins the militia. 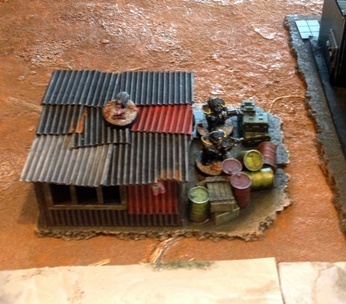 The Squat Engineer activates his Mind Swap Helmet and dominates Inquisitor Verhoeven. 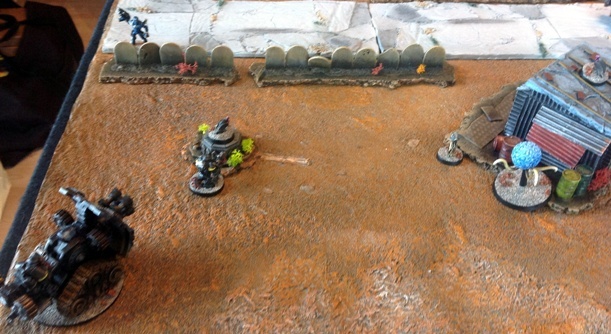 Already having suffered damage from the machine gun team in the distance, Rosa is taken by surprise when the Inquisitor blasts her, taking her out of the game. 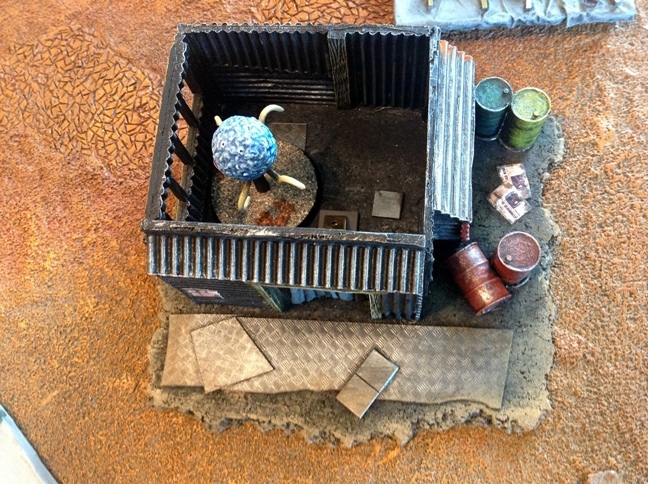 The Cerebalite conceals itself in a shack, shrouding itself in mental camouflage while the Medushark finally gets dispatched by the assassin. Surprisingly cocky after coming a cropper last time, the Astropath tries his luck towards enemy lines. Outclassed in the mental duel the Cerebalite (in the shack on the top left) makes Astro-pats head explode. The thudd gun (top right) then drives over the assassin (pancaking him) while a mind controlled Verhoeven mops up the last of his own team. The Mind Swap helmet was fun and felt just like the end of act two in many TV shows, but it meant the end of any chance that the Imperials had. The Imperial Assassin cocked things up a bit too: he was quite unlucky to get bogged down in the way that he did, which in turn allowed the units that he was attacking to have more of an impact than the Imperials had hoped for. Story wise it was a pity that the Huscarl wasnt freed. We assumed that the diversion caused by the Imperials gave him the chance to escape and get back to friendly territory, ready to furiously exposit various narrative plot points (the presence of the evil mind controlling Tenebrainians, how they controlled the Ursa Miners all along, his own painful resistance to their evil mind control, the technique required to unlock the mental shackles on the rest of his kin and the location of the Tenebrainian base) ready for the inevitable confrontation in the third act. NEXT TIME: floating tentacled brain aliens in a graveyard. 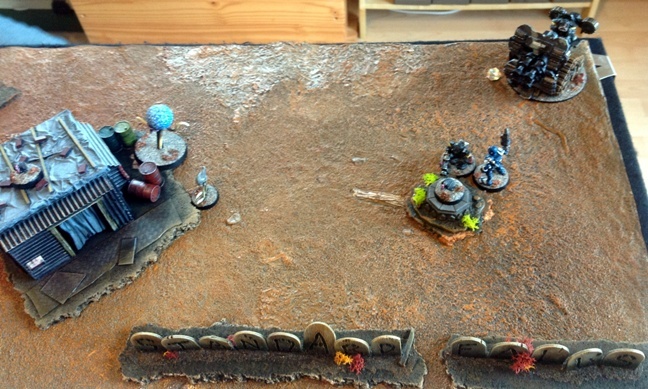 Your inquisitorial hijinx coupled with the interplanetary beastiary is really getting my 28mm scifi juices boiling. I don’t need more juices boiling. 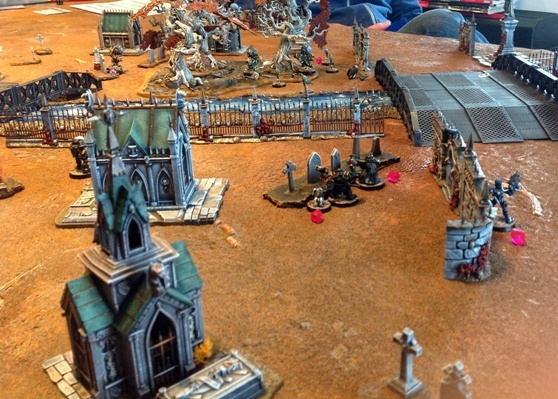 Seeing repatriated miniatures on other peoples blogs is always fun, like the Blood Bowl player here.